Soil Requirement: Well-drained, average soil. Avoid heavy soils. Delightful, colourful blooms all summer and fall! 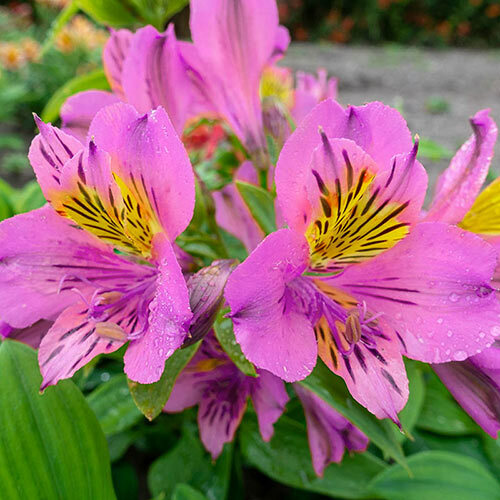 With their compact habit and long-flowering period, Majestic Alstroemeria are the perfect choice for creating a border or gracing the containers on your patio. Alstroemeria reach a modest height of 18-20" and they deliver more than 5 months of blooming, all summer through fall, especially with regular deadheading. 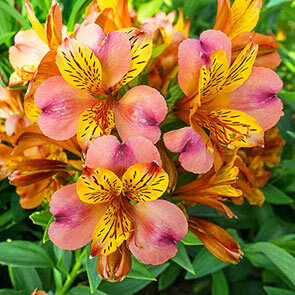 Also known as Peruvian lily, alstroemeria will delight you with their clusters of funnel-shaped flowers. Each cluster contains up to 15 flowers, and each lovely flower measures 2½" across. The charming blooms sit atop erect stems with linear, lance-shaped green leaves that are 3" long. The flowers make a great, long-lasting choice for bouquets, retaining their beauty in your favourite vase for about two weeks. 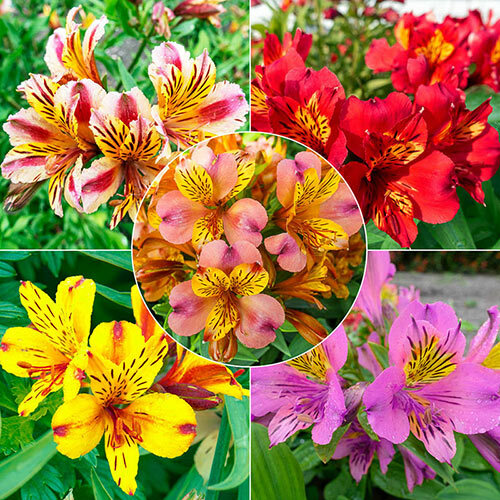 With their improved cold hardiness, the alstroemeria in this collection will perform from zone 9 to as far north as zone 5! And they attract beneficial bees. The dark maroon markings on the petals of each variety in this series serve as nectar guides for pollinators coming in for a landing. 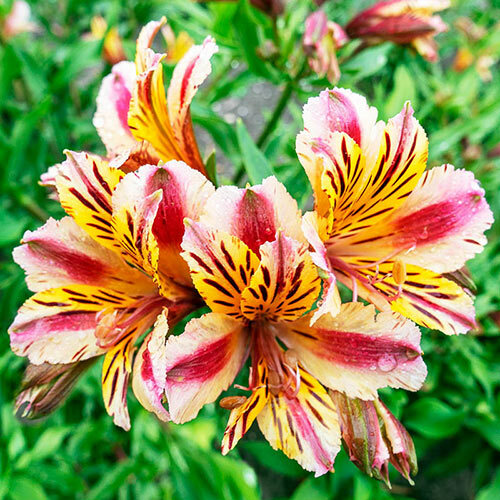 With alstroemeria in your garden, you'll entice more pollinators to your garden and promote the propagation of edible plants we all enjoy, such as apples, pears and plums. Apply 1-2" of mulch in zones 5 and 6. So skip the trip, order from home and enjoy the value and versatility that Breck's provides. 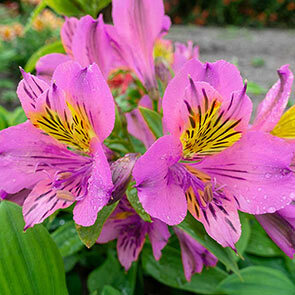 The alstroemeria varieties in this collection are low-maintenance perennials you'll enjoy for years to come. These beauties prefer a rich, regular to slightly acidic soil that is not too heavy. 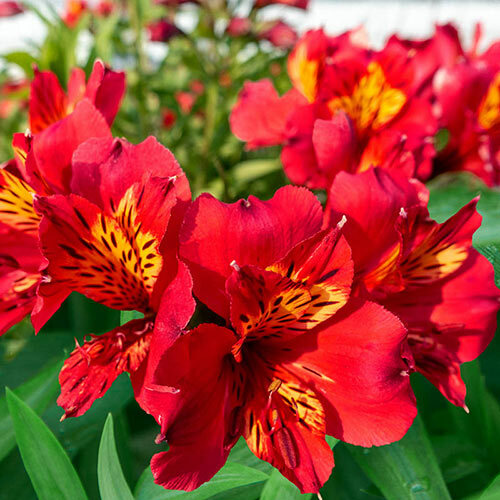 Plant in the spring, in a spot with full sun or partial shade, and you'll soon be enjoying an exceptionally long and colourful season of blooms. Marie: Marie brings a dynamic look to the collection with yellow petals and creamy-white sepals accented with broad, central bands of maroon. Liré: Exotic and dramatic, Liré is an intensely red flower. Hints of yellow near the centre of each petal give the blooms an extra bit of sizzle. Serrant: With warm yellow petals and sepals, Serrant will shine in your garden. Each petal and sepal is delicately brushed with reddish-pink highlights. Tiercé: Tiercé blooms in a mouthwatering pink hue, and the yellow throats of the petals make this eye candy all the more appealing. Henri: The colours of dawn give Henri a tropical glow. 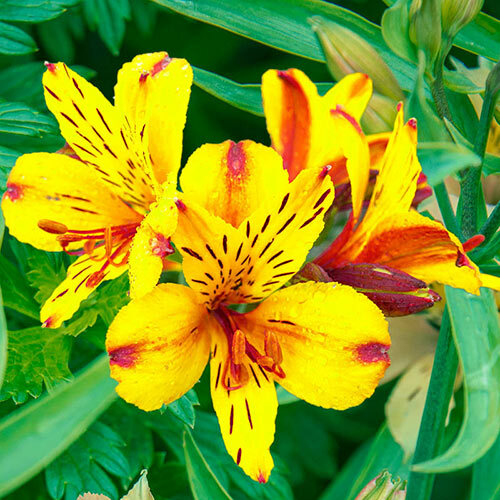 Its bright yellow petals rise gently above sepals flushed with hues of pink. Flower Form Funnel-shaped flowers in terminal clusters. The flowers in the clusters are 2.5" in diameter. Clusters contain up to 15 flowers. Foliage Type Erect stems with alternate, linear, lance-shaped leaves, 3" long. Planting Instructions Do not plant too deep. Plant with the eyes just below the soil. Firm soil around the roots and water thoroughly. Soil Requirements Well-drained, average soil. Avoid heavy soils. Pruning Remove spent flower stems. This will encourage the plant to continue flowering.